New Jersey Tops List of Outbound Moves while Western and Southern States Lead Inbound Moves. States in the Mountain West and Pacific West regions, including Oregon, Idaho (62.4 percent), Nevada (61.8 percent), Washington (58.8 percent) and South Dakota (57 percent) continue to increase in popularity for inbound moves based on the national movers study. In tune with this trend, Arizona (60.2 percent) joined the list of top 10 inbound states in 2018. The National Movers Study reveals the business data of inbound and outbound moves from 2018. In addition to this study, United Van Lines also conducts a survey to find out more about the reasons behind these moves. A leading motivation behind these migration patterns across all regions is a career change, as the survey showed approximately one out of every two people who moved in the past year moved for a new job or company transfer. Other reasons for the high percentage of moves to the Mountain West in 2018 include retirement (28.1 percent), proximity to family (20.8 percent) and lifestyle change (19.4 percent). Compared to all other states, Idaho saw the largest influx of new residents desiring a lifestyle change (25.95 percent), and more people flocked to New Mexico for retirement than any other state (42.74 percent). Americans are on the move, relocating to western and southern parts of the country. 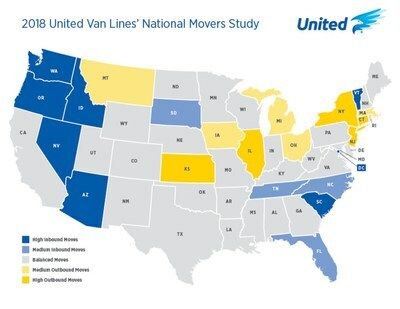 The results of United Van Lines’ 42nd Annual National Movers Study, which tracks customers’ state-to-state migration patterns over the past year, revealed that more residents moved out of New Jersey than any other state in 2018, with 66.8 percent of New Jersey moves being outbound. The study also found that the state with the highest percentage of inbound migration was Vermont (72.6 percent), with 234 total moves. Oregon, which had 3,346 total moves, experienced the second highest percentage nationally, with 63.8 percent inbound moves.